For some reason there's been a terribly long run of movies I didn't want to see at the theatre downstairs, which is part of why I made a beeline there on Friday night to see Hotel Transylvania 2. 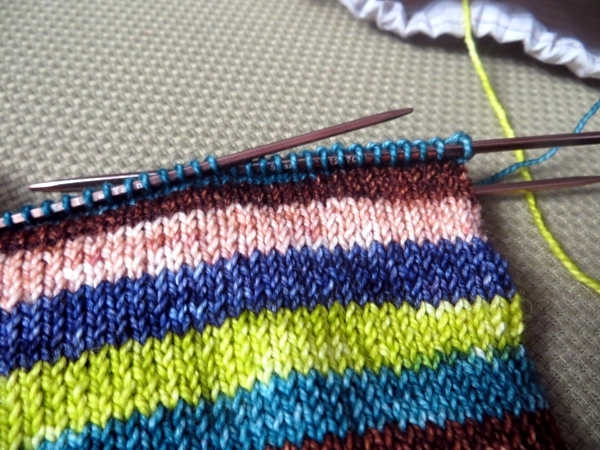 And knit! Seriously guys, this is huge - I knit through the ENTIRE MOVIE without making a mistake or looking down! I could not believe it. 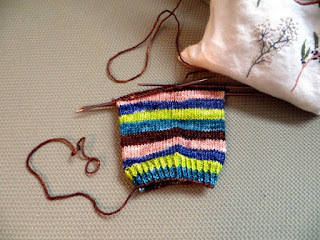 When I sat down, I had a ribbed cuff, and when I got up I had all those gorgeous stripes looking back at me. Tonight I went to see another movie - The Intern - and was so excited to get back to my sock. Sadly... I only got a tiny little bit farther. 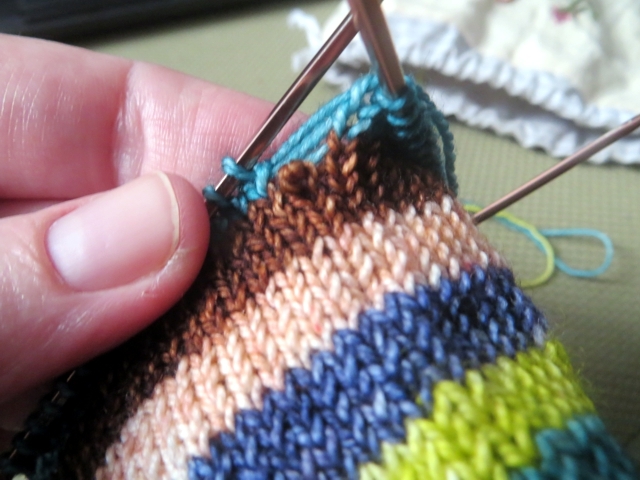 Like, I finished the brown stripe and got two rounds into the turquoise. Colour me sad. Here's what happened. I jerked my hand awkwardly during the opening sequence and dropped a stitch, then had the sickening realization that I had actually let it unravel down a level or two (I was correct), and I couldn't trust myself to pick it back up and rethread the stitches above it. I had no choice but to give up and just sit and watch the movie. And you know what, I didn't shrivel up and die. I ate a lot of popcorn, but that's not exactly the same thing. I kind of want to see Black Mass now... see if I can win two out of three! Hope you've been having a good week so far and I'll see you tomorrow. I dropped a stitch on a shawl that had grown to 445 stitches, it had dropped too far by the time I noticed so I had to rip back to 163, was a great movie, but watched on my TV. No theater within 45 miles or so. Love the colors in your yarn.. 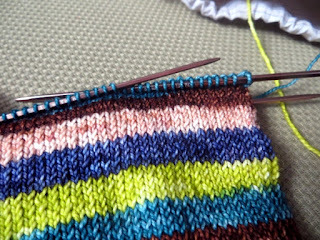 I'm still working up courage to pick up socks again, LOL! I've even found them at the Dollar Store. It helps to cover them mostly with painter's tape, because they're really bright! At work they call me the Amazon queen. What a good excuse to buy more knitting stuff! Now to teach my 12 yo to drive for trips ... just kidding, but it will be nice when she can help drive! Four more years, Karen, just four more years!